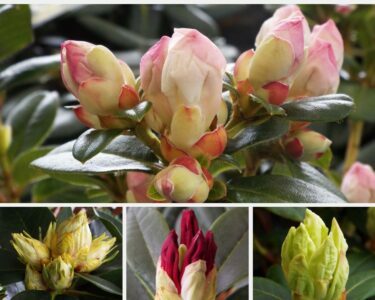 For the last few weeks I have been watching the buds swell on the Rhododendrons and waited in eager anticipation for their eye-catching flowers to open with wine-red, delicate pink, deep purple or snow white blooms that are a colourful addition to any flowerbed. 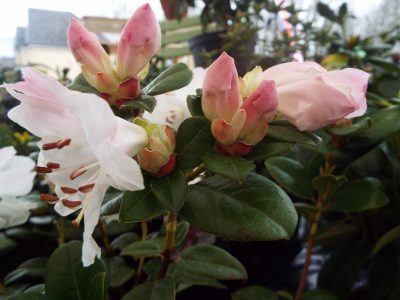 The first to open was Dwarf Rhododendron Cilpinense with its large, pale pink blooms with a deep rose blush. 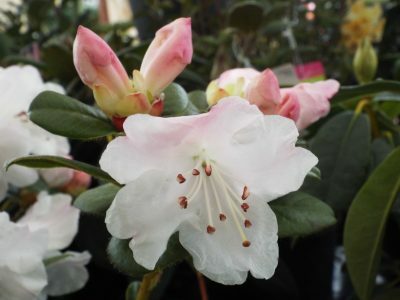 Rhododendrons have brightly coloured flowers, red through pink, orange and yellow to white, and with blue and purple to add, which bloom from late winter through to early summer depending upon which variety you choose. The first Rhododendron to be classified and named was R. Hirsutum which was discovered by the 16th century Flemish botanist, Charles l’Ecluse. It was introduced to Britain in 1656 from the European Alps and is the national flower of Nepal. From these humble beginnings, plant breeders have developed over 20,000 exotic hybrids so there is one for just about every garden situation. Rhododendron prefer acidic soil so plant with ericaceous compost. Every day now there are more flower buds swelling and getting ready to burst into flower with technicolour abandon, I wonder which will be next …………..they are a show not be missed. In stock now so do pop in and see their beauty for yourself.